Atherosclerosis is a specific type of arteriosclerosis, but the terms are sometimes used interchangeably. Atherosclerosis refers to the buildup of fats, cholesterol and other substances in and on your artery walls (plaque), which can restrict blood flow. The plaque can burst, triggering a blood clot. Although atherosclerosis is often considered a heart problem, it can affect arteries anywhere in your body. Atherosclerosis may be preventable and is treatable. 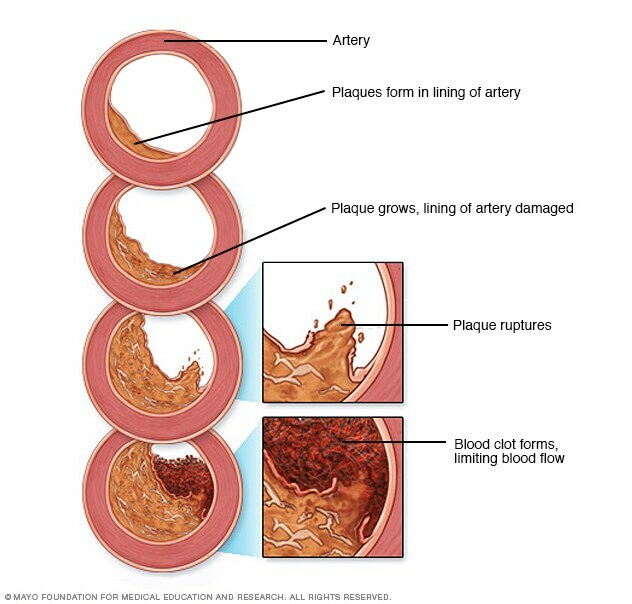 Atherosclerosis develops gradually. Mild atherosclerosis usually doesn't have any symptoms. You usually won't have atherosclerosis symptoms until an artery is so narrowed or clogged that it can't supply adequate blood to your organs and tissues. Sometimes a blood clot completely blocks blood flow, or even breaks apart and can trigger a heart attack or stroke. If you think you have atherosclerosis, talk to your doctor. Also pay attention to early symptoms of inadequate blood flow, such as chest pain (angina), leg pain or numbness. Early diagnosis and treatment can stop atherosclerosis from worsening and prevent a heart attack, stroke or another medical emergency. Once the inner wall of an artery is damaged, blood cells and other substances often clump at the injury site and build up in the inner lining of the artery. Over time, fatty deposits (plaque) made of cholesterol and other cellular products also build up at the injury site and harden, narrowing your arteries. The organs and tissues connected to the blocked arteries then don't receive enough blood to function properly. Eventually, pieces of the fatty deposits may break off and enter your bloodstream. In addition, the smooth lining of the plaque may rupture, spilling cholesterol and other substances into your bloodstream. This may cause a blood clot, which can block the blood flow to a specific part of your body, such as occurs when blocked blood flow to your heart causes a heart attack. A blood clot can also travel to other parts of your body, blocking flow to another organ. Aneurysms. Atherosclerosis can also cause aneurysms, a serious complication that can occur anywhere in your body. An aneurysm is a bulge in the wall of your artery. Most people with aneurysms have no symptoms. Pain and throbbing in the area of an aneurysm may occur and is a medical emergency. Chronic kidney disease. Atherosclerosis can cause the arteries leading to your kidneys to narrow, preventing oxygenated blood from reaching them. Over time, this can affect your kidney function, keeping waste from exiting your body.